There are many companies that provide the same type of material that we use. The key however is in the installation. SAE Builders is best known for it's quality above all else. Properly installed siding can bring new life to tired home. Premium vinyl siding won't warp or rot like wood. Never needs sanding, scraping, painting or staining like wood. Restore like new appearance by rinsing with garden hose. This is a great example of the versatility of new vinyl siding. 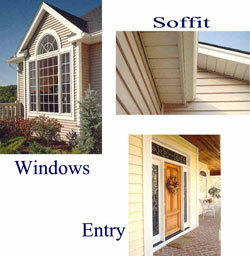 We deal in several types of vinyl siding from different manufactures. There are many styles to choose from. Different products can be used alone or together to create a unique new look for your home. 5 1/2" half log siding and all metal roofing creates a very attractive look with minimal maintenance. Painted hardboard siding embossed with realistic wood grain provides the look of cedar without the flaws.